How many workbenches do I need? 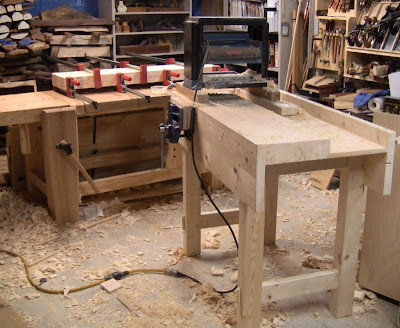 I have my large Schwarz/Roubo workbench in the basement, my Roy Underhill portable workbench that I take to offsite classes and demos (and I have a second partially built to accommodate more people), and now I need four for the Close Grain School of Woodworking. Seven is the lucky number. 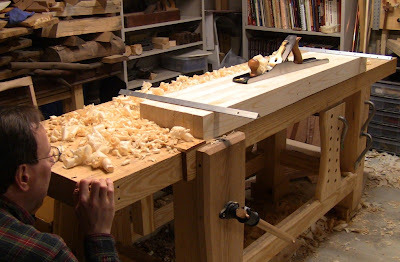 I like the workbench in Paul Sellers' book and DVD series Working Wood , so when I started the school, that was the design I chose. The combination of book and DVD provide an excellent guide to building it. 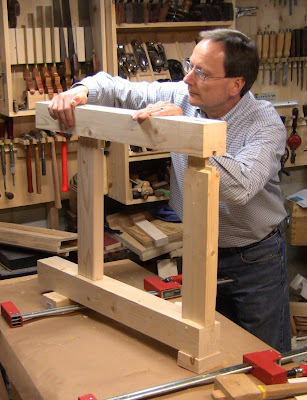 He also addresses the issue of how to build a bench when you don't have a bench to work on. You can read my review of this series here. This bench has a number of nice attributes. Built from construction-grade 2x4's and 2x6's, it's inexpensive (about $65 in materials, excluding the vise), so is affordable in multiples. It's a nice size, beefy without being too heavy. I can fit two of them in my van, possibly even all four, since I shortened them by a foot. It's also very sturdy, a combination of the laminated 2-by stock and the interlocking joinery. At that, it's simple to build. It's also a time-tested design. Paul says it's been used in Britain for centuries, and he uses it in both his UK and US schools. The structure consists of two mortise and tenon leg frames, with aprons housed on them. This mechanical interlock provides excellent rigidity. 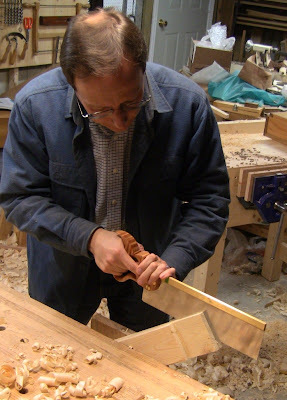 The thick laminated top is secured to the apron, with a simple tool well behind it. With the addition of a traditional cast iron quick-release vise that itself weighs 40 lbs., it provides a solid work surface for students. The design can also be adapted easily. As I mentioned, I shortened mine to 4', making it easy to build with 8' stock. That's the size of my portable workbench top, and I've found that to be adequate. Paul builds his at 38" high, which I found a bit too tall (but of course it depends on the individual). I made mine 36" and 34". The depth can be increased by additional laminations, and the size of the aprons can be changed. I also omitted the quarter-round molding in the tool well. Other than that, I followed the design exactly. I did notice after building two that I had oriented the leg laminations rotated 90 degrees from his, but that shouldn't be a problem. Here I've documented building bench #2. I kept a good record of the time required. Excluding waiting for glue-ups, it was 28 hours of labor spread over 2 weeks. As with my Roubo, I did everything with hand tools, except that I used a benchtop planer to plane down the 2x4 edges to eliminate the rounded corners. Building these is good for practicing Paul's joinery techniques. For the vise, I used the Anant version of the Record 52 1/2 ED quick-release vise , sold by Highland Hardware. Watching Paul work in the DVDs convinced me to spend the extra money for quick-release. He just goes zip-zip-zip moving workpieces in and out of it very efficiently. 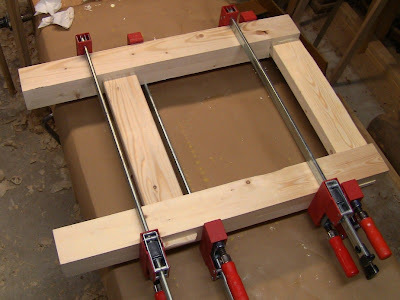 I have non-quick-release vises on my first workbench (oh, yeah, I forgot to count that one, 2x4's, plywood, and MDF, but it no longer counts), and they're slow and annoying to work with. After planing, I worked on the top. 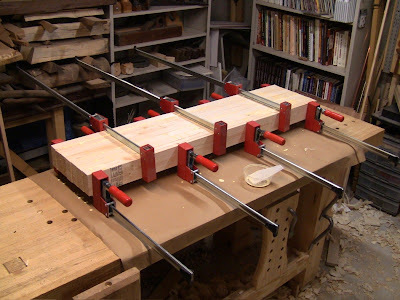 I staged the glue-ups for the top and legs so that whenever I had anything in the clamps, I had other parts to work on. One thing I didn't do, that I did on the first one, was to run all the 2x4 faces through the planer. This resulted in poorer laminations than the first one. That was a pretty dumb mistake. Functionally, all the laminations are sturdy, but aesthetically they're not as good. I ran the planer on bench #1. Flattening the top, starting with a #5 diagonally across it for heavy stock removal. Final flattening with a #7, sighting across winding sticks to check for wind. With the top flattened on both sides, I worked on the leg assemblies. First I planed them up clean and square. Trimming a leg to length. The way to get a clean, square cut is to cut about 1/4" deep, then roll the piece, repeating for all four sides. Each little bit of kerf already established helps guide the next. Keep repeating until all the way through. Note the auxiliary bench hook on the right to support the far end of the piece. The four legs trimmed and marked so I wouldn't get things mixed up as I fitted each joint. Mortising a leg, using Paul Sellers' mortising technique. 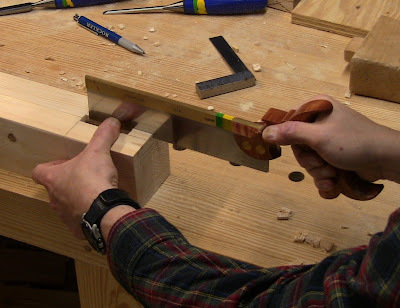 Cutting the haunch in the top mortise. 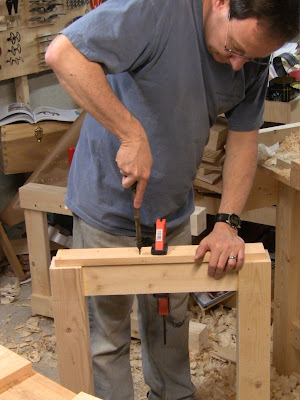 The haunch provides the twist-resistance of a full-width joint, even though the tenon will be only partial-width, due to the location at the top end of the leg. The actual tenon needs to be cut to fit this haunch. 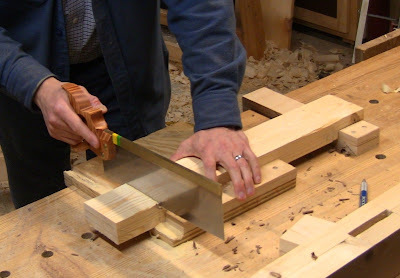 Cutting the shoulder in the tenon on a rail. 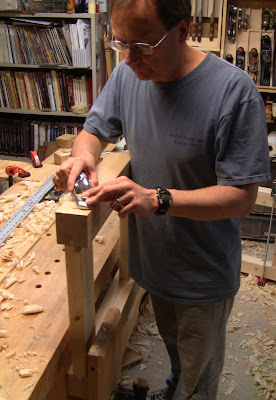 Cutting the cheek of the tenon. 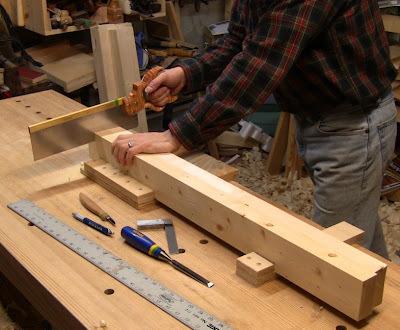 The tenons on the lower rails protrude 1/2" in the Art and Crafts fashion. Paul shows several possible end treatments. I chose to round them with a plane, then round off the corners with chisel and rasp. Assembling the leg frame. 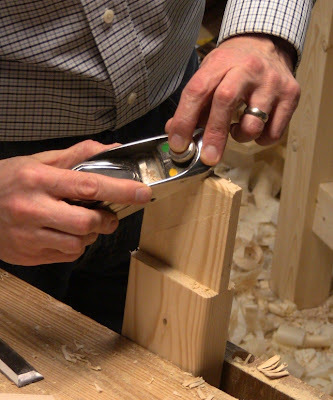 The spacer blocks accommodate the protruding lower tenons. 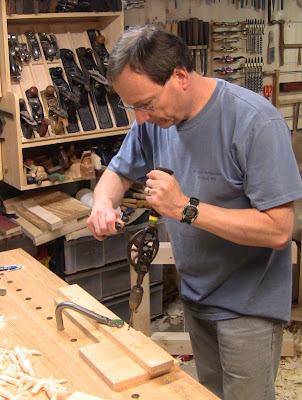 Trimming the upper tenon end flush with a block plane. The leg frames are attached to the top and well-board with bearer boards. I haven't used this method before. The bearers are predrilled with two sets of holes, then screwed to the top rail of the leg frames through the first set of holes. They'll be screwed to the top from the underside through the second set of holes. For the screws that will secure the top, predrilling the holes at an angle. Countersinking the holes on both sides. Drilling the pilot holes in the top rail of the frame. Glue-and-screw the bearer to the top rail. With the leg assemblies complete, the next step is to cut the housings in the aprons, which I had already hand-jointed and edge-glued from 2x6's. 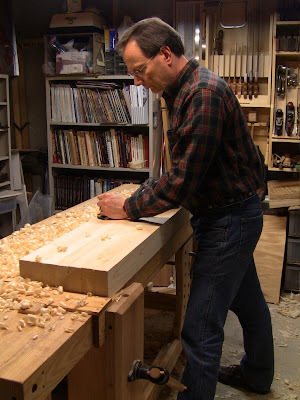 Looks like you're well on your way to making a great series of benches, Steve. Well done. Steve, I'm fascinated with this design, it violates so many of The Schwarz's rules, and yet, Paul Sellers is an epic craftsman. With its seemingly lightweight design, is it solid enough to stay put on the floor when you're doing something heavy like traversing? Just wondering; the only thing I dislike about my mini Roubo style bench is that the pine was too light; if I plane too vigorously, sometimes it likes to slide a bit. Otherwise, quite an economical solution to bench building! Yes, this one definitely follows a different lineage. It's higher as well. It does still have a fair amount of mass. I should weigh one, but I'd estimate 70-80 lbs. Then the vise adds another 40 lbs. We'll see how it works out. Since I have multiple benches, and the barn floor they'll be on is actually plywood sheathing that's not perfectly flat, I'm planning on pairing them up back-to-back. That should help stabilize them against the uneven floor and movement. It's also possible to put a board across the lower rails and weigh it down for stability. I attended a class at Paul's NY school where most of the benches were paired together except for the bench front and center that Paul uses while (whilst UK) teaching. Are the plans for the workbench available separately from the DVD set? Yes, the book has the dimensions and written build process. So you can get by with just the book and follow that. It also includes the other techniques covered in the various videos. The advantage of the videos is seeing the techniques in action. You could also get just the workbench DVD along with the book. These look like really great benches. I went to the lumber yard after reading your blogs and already have most of the laminations done. I can't wait to start on my first mortise and tenon joints. Sink or swim right? I always love reading about your projects, your posts are always so informative. Keep up the good work! Hello I just started a bench build and i dont have a planer. I was hoping to get your opinion, after hand planing the top edgse and faces for the benchtop i have a fair amout of defference in the 2x4 thicknesses should i thickness them individually or laminate then do the top and bottom as a whole. Don't worry about variable thicknesses. Once you have them flat so they'll glue up well, go ahead and glue them up. Just align all the edges in the glue up so that you only need to worry about planing side one side of the top. 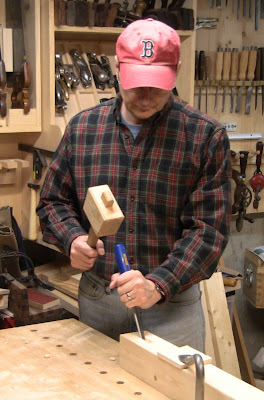 If the varying thicknesses mean you are a little short on the desired depth of the top, add another 2x4. Once it's dried, plane up the top as a single unit. 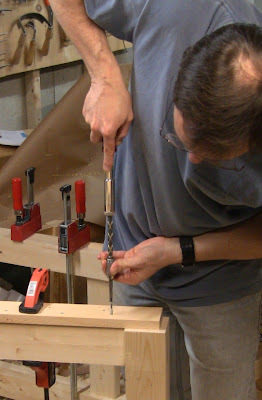 You can actually do that as one of the final steps of the project after the bench is assembled and standing up. The side that you kept aligned for the glue up can be the bottom face of the top. You need to plane the top surface to flatness no matter what. 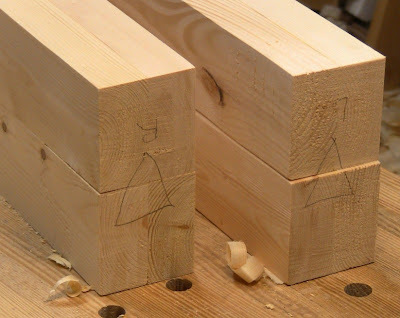 If there's a lot of variation in it due to the 2x4's, don't worry, you'll work that out pretty quickly with the planes (use a #5 with a cambered iron to take it down to a uniform thickness fast, then do final flattening with a #6 or #7). I am looking to build this same bench and have the book as well. I saw his you tube series and think that one is too deep for my space. Can you comment on the two? I have waffled on maybe making a 30" deep version of the youtube shorting the well and back section. I've been very happy with the book version and found it to be very practical. The YouTube version is nice if you have the space for it and plan to work from both sides. The overall design is very scalable in length and depth. I made mine 4' long to fit across the back of my van. From a construction standpoint, the single-top is a little easier than the split-top, but the top slabs are easy enough to make that it shouldn't too difficult. If you aren't going to access it from both sides, the split top may be too deep to be practical. That's a long reach all the way across. It might come in useful occasionally for large assemblies, but that may not be frequent enough to be worthwhile. Be careful about overcrowding your workspace. Curious if the 4' length is long enough. Do you find you're able to plane without the bench moving? Yes, this works very well. Any additional length helps of course. 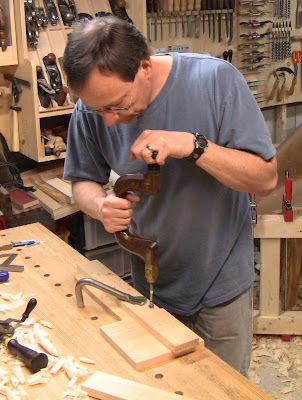 The bench is about 40 lbs, and the vise is about another 40. Nonskid surface helps too, like rubber feet/pad or some nonskid shelf liner. But in general there's enough mass. Steve also have pauls book and dvd. In europe most timber is 28 x 70 or 45 x 70 mm. Will thia cause me to rethink al measurements? You used 2x4" but those also didnt fit THE sizes from THE book? The best thing to do figure out the finished dimensions you're going for, then work out how many pieces of timber you'll need. So you'll need to do some adjusting, but not too difficult. The key is to fit joints and cuts to the actual pieces you have. Don't worry too much about the specific numbers; instead worry about how to achieve the specific fit and proportions. Also, if those are the finished timber dimensions, they're not far off from actual 2x4 measurements, which actually 1.75x3.75 or 3.5. At 25.4 mm per inch, 45 mm is just over 1.75". The 70 mm dimension is under 3", but two 45 x 70 mm pieces glued up should be a substantial enough leg. And a bunch of them laminated for the top will produce a thick-enough top.